I was fortunate to be able to attend the ILADS (International Lyme and Associated Diseases) conference a few weeks ago. 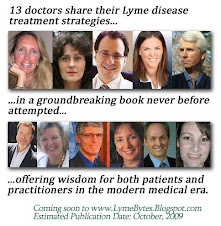 I had never been to an ILADS conference, and learned a few new things about Lyme disease and treatments while there. Of particular interest to me was a presentation by Dr. Burrascano, in which he shared insights into how to discern different Lyme disease co-infections. Since lab tests for co-infections are often negative or unreliable, and tests don't exist for many strains of the different infections, it can be difficult discovering whether these are present and active in the body. Dr. Burrascano cited different means for discovering the presence of such infections, including the patient's symptom picture and response to treatments. The onset of symptoms for those with Borrelia burgdorferi can be slow and gradual. You may notice that you are no longer sleeping well, for instance, or are losing weight. In my own case of illness, I had back pain and extreme anxiety for several years before the onset of other symptoms. Then, months before my "crash" in 2004, I began to lose weight, as well as my appetite. I didn't think much of it at the time, even though people commented to me that I was getting thinner. Borrelia is also a multi-system bug, that usually causes multiple (and sometimes, a multitude!) of symptoms. These symptoms can change over time, and wax and wane over several weeks. For instance, you may start off with a pain in your upper back that over time, moves to the lower back and varies in intensity (When the pain doesn't migrate but remains constant, however, then this can sometimes be indicative of damage done by Borrelia, rather than the bug itself). So one year, you might have gut pain, and in the next, experience buzzing in your head. That's the nature of the Borrelia beast. People who present with very serious symptoms of Lyme disease may also have Babesia, since this infection makes Lyme symptoms worse and Lyme treatments less effective. If you are responding slowly to Lyme treatments, you might also have a Babesia infection that needs to be treated, as well. * Morning fevers, usually around 99 degrees Fahrenheit. Keep in mind that these symptom patterns are only generalizations, as infections can cause a multitude of symptoms that overlap with those of others, especially Borrelia, since it can cause over 300 different symptoms which encompass every bodily system. Discerning infections in those who are multiply co-infected may therefore be difficult, but by studying this list, you may notice certain patterns in your symptom picture which enable you to discover whether you have one or more of these infections. Through my experiences of talking with other Lyme disease sufferers, I have found that more often than not, people are infected with at least one of, if not all of, the above infections, in addition to Borrelia. 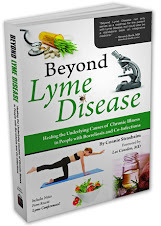 In my new book on Lyme disease, Dr. Steve Harris notes that those who have been sick for more than twenty years tend to be those who have only Borrelia as their main infection. Whether this is because ticks twenty or thirty years ago weren't carrying around as many nasty infections as they do now, I don't know, but the finding is intriguing. 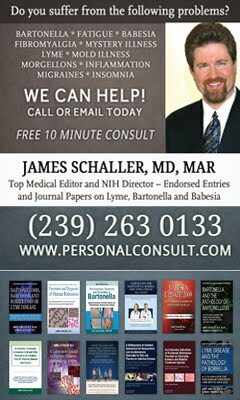 Hopefully, this information will help you and your physician to navigate your healing process, as Lyme disease tests, by themselves, are rarely sufficient for making an accurate diagnosis. It was rather interesting for me to read the blog. Thanx for it. I like such themes and anything that is connected to them. I would like to read a bit more soon. What cures Babesia. That's all I want to know.